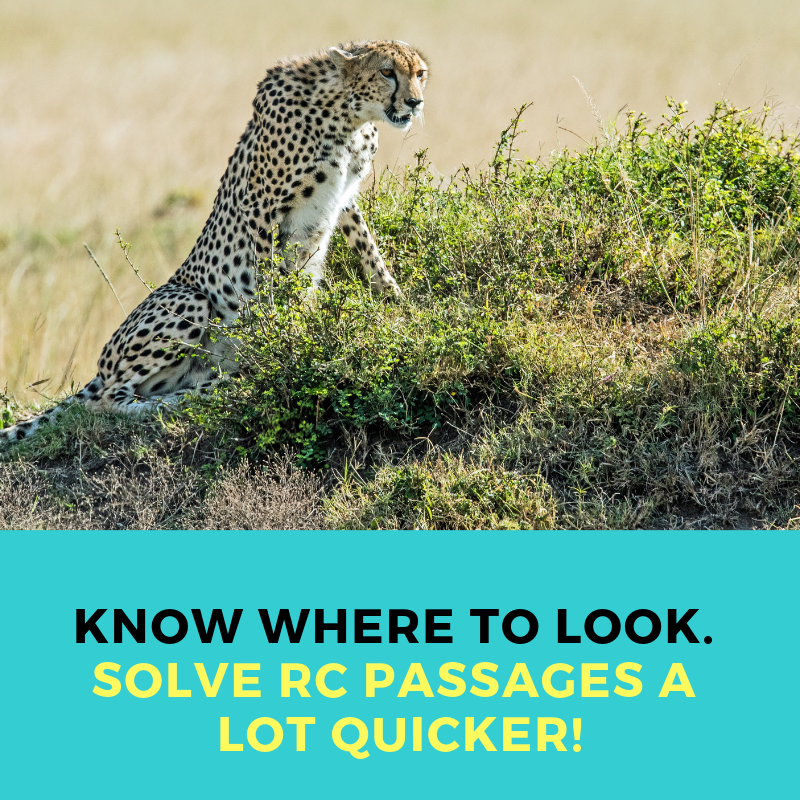 GRE Reading Comprehension - The Definite Guide to Solve RC passages! We understand that RC’s are probably the SCARIEST part of the GRE verbal. And its only getting tougher. How to CRACK the GRE Reading Comprehension passages? That is exactly what we’re going to do today. #3 What does an RC Passage contain? When I say ‘types’, I mean the way these GRE Reading Comprehension passages are structured. 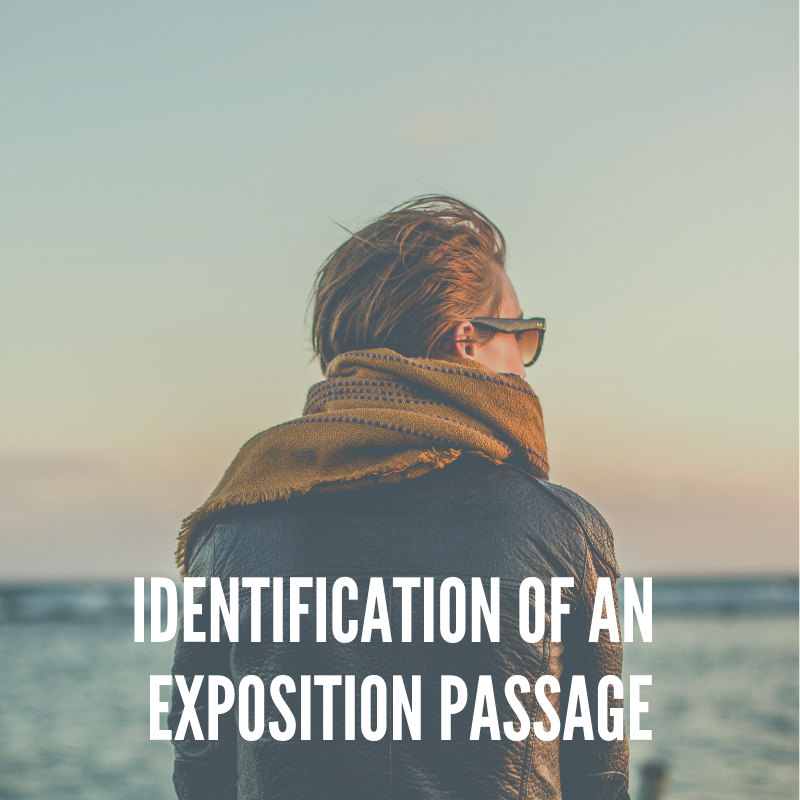 An idea of the structure of passages and understanding what they’re trying to tell you in a broad overall sense is a huge key to cracking the meaning of those passages. I’m going to show you exactly how helpful that is so let’s go ahead and dive in. Even though reading has always been an important skill to possess, most of us struggle in improving reading comprehension skills. But this is possible when you start with analysing the deep roots of the problems and framing the techniques accordingly. GRE reading comprehension – I’m just going to give a really brief introduction for those of you who have just now started your prep and don’t have a very clear idea. So in the GRE we have two sections, right? Ideally that is that the Quant and the Verbal and apart from that you also have something called the GRE analytical writing. 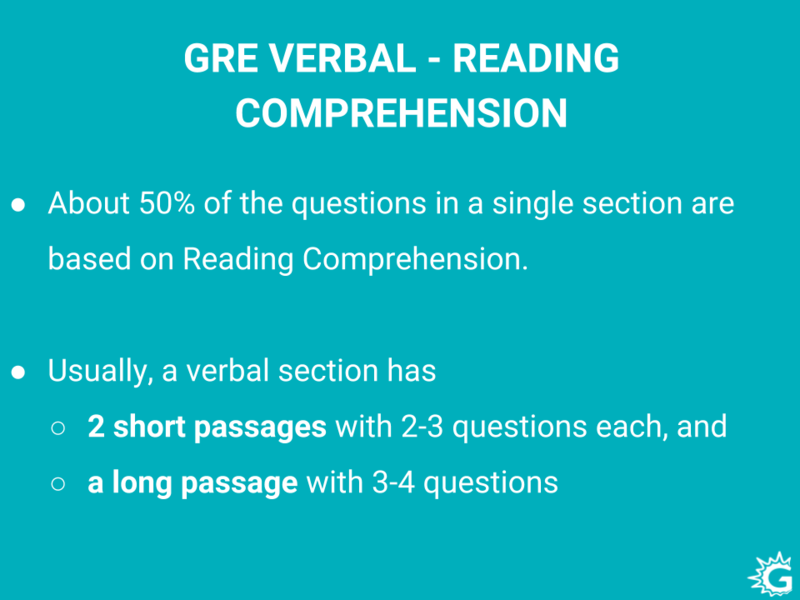 One of the most important parts of the GRE verbal reasoning is the Reading comprehension. These reading comprehension questions occupy half of the Verbal questions. You can get a good score from reading passages right and answering questions correctly. All you you need to do is follow the GRE strategies and reading techniques to score high. Fifty percent of your entire verbal score is going to be based on your reading comprehension performance. 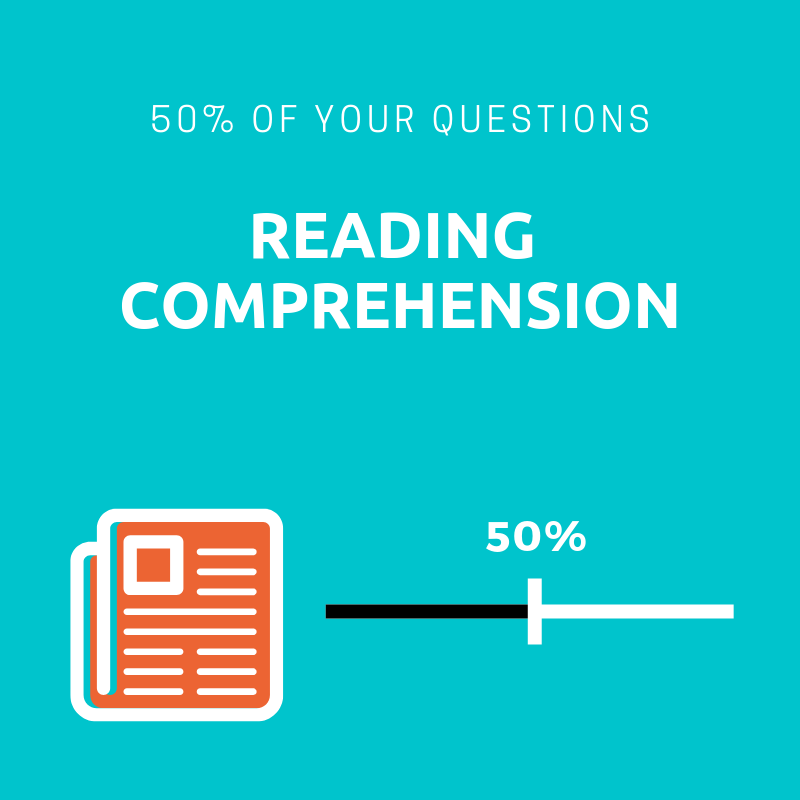 In a verbal section, to get an idea of how many reading comprehension questions you can expect to encounter, you will probably see within one section, two short passages with about two to three questions each and along with that one long passage. 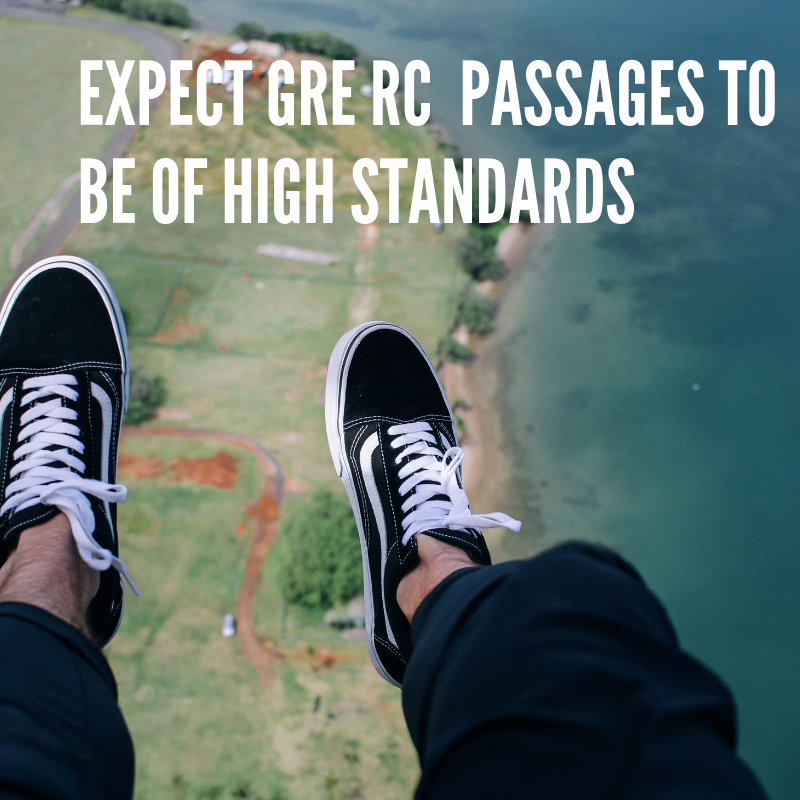 Ready To See Where you stand in the GRE RC? And remember, you’re going to see at least two full verbal sections in your GRE – you may even see three, so you need to prepare yourself for anywhere between four to six short passages and two to three long passages . These are the number of questions that those typically have and now what we’re going to focus on is not so much the questions and the question types but rather the GRE RC passages and what they consist of. So why do you need to understand GRE reading comprehension passage types? How’s that going to help you? 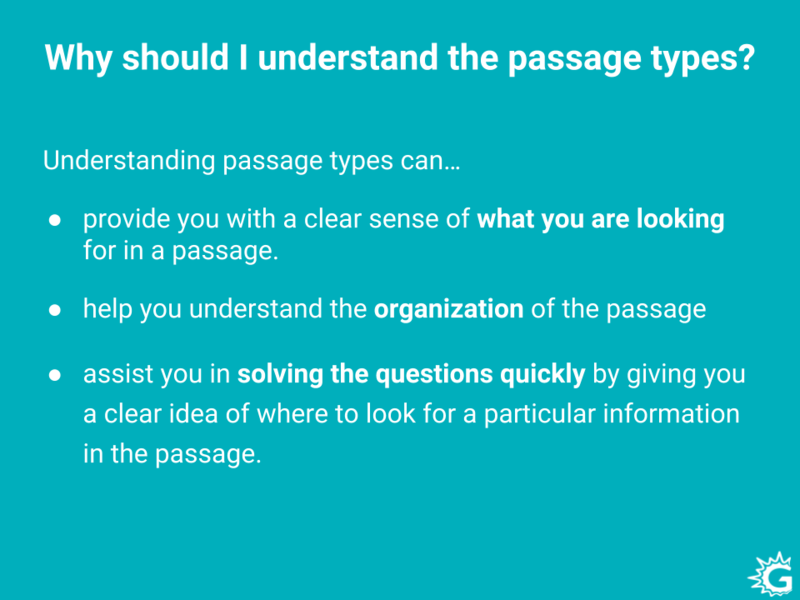 Well, understanding passage types can help you in a lot of ways. One of them is that it is going to provide you with a very clear sense of what you’re looking for in a passage so once once you have an idea, the first couple of lines will give you a hint and kind of a peek into what the passage holds. 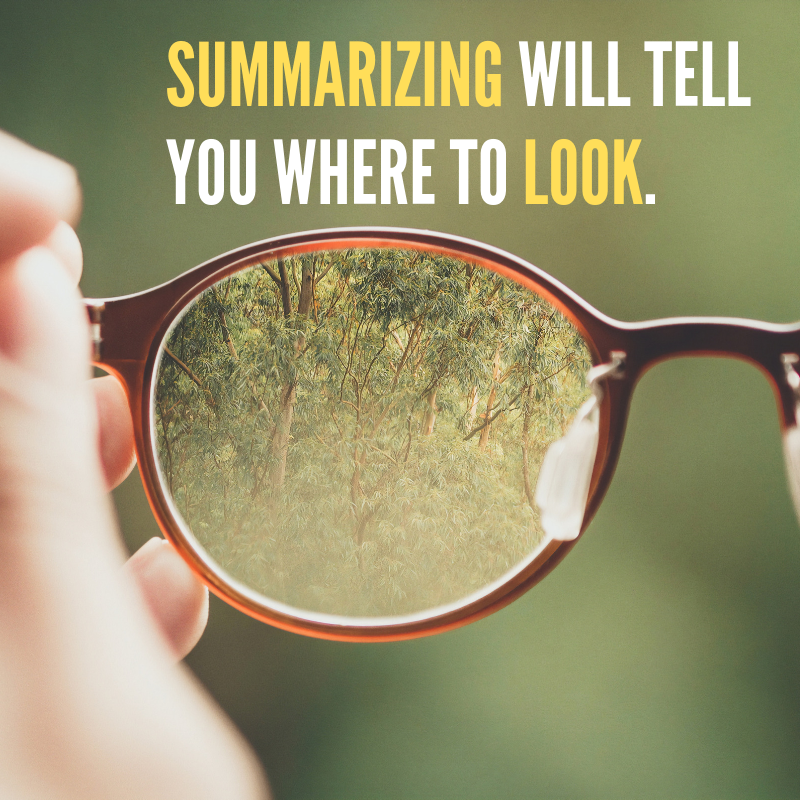 You’ll have a better idea of what to expect and what that type of passage typically consists of and that also helps to tackle the questions, right? So once you have this clarity, you will also understand the organization of the passage– the way it’s been structured in order to to present the information to you in a sensible, logical way. You will also understand how once you’ve got a grasp of what the passage has and how it’s organized, how it’s structured to deliver that information, you would be able to solve those questions a lot quicker because you know exactly where to look for for the answers. You will have a very thorough understanding of not just the RC passage but its mechanics and that’s what we’re going to arrive at today, that’s what we’re going to see. Test your knowledge from the free online reading comprehension practice questions. 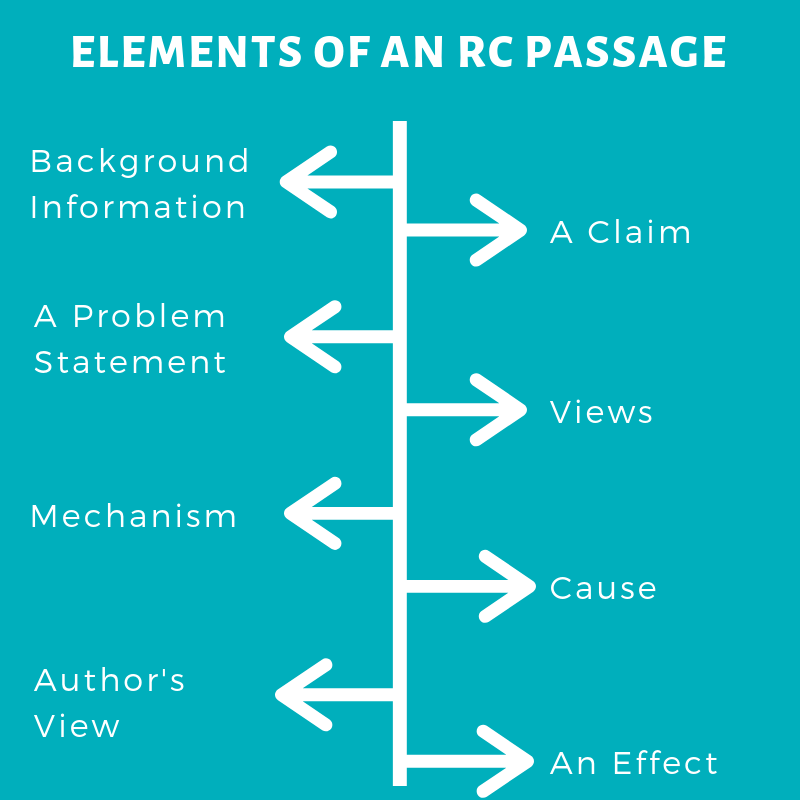 What does an RC Passage contain? So what kind of things do a GRE RC passage contain? What we are looking at here – I’m going to have a lot of terminology coming up and I’m sure it’s going to look a little scary but don’t worry about it. As I explain all of them to you they’re going to become very simple and clear and you’re going to see some examples as well. GRE RC Practice Questions at your fingertips! So any GRE RC passage is a logical flow of information, okay? By nature, any piece of writing typically has some logical flow of information – somebody is trying to present some detail to you in a cogent fashion, so all of the sentences are going to be linked to one another and one point will flow to the next in a natural way. In that sense it is very logically structured and the GRE RC passages goes without saying are of a very high standard. This is the kind of material that you are expected to be able to read and understand for your graduate studies programs that you are applying for so it is going to be of a very high academic standard and it is going to have a logical flow of information which means there’s something very clear in there and it’s got a very clear purpose. 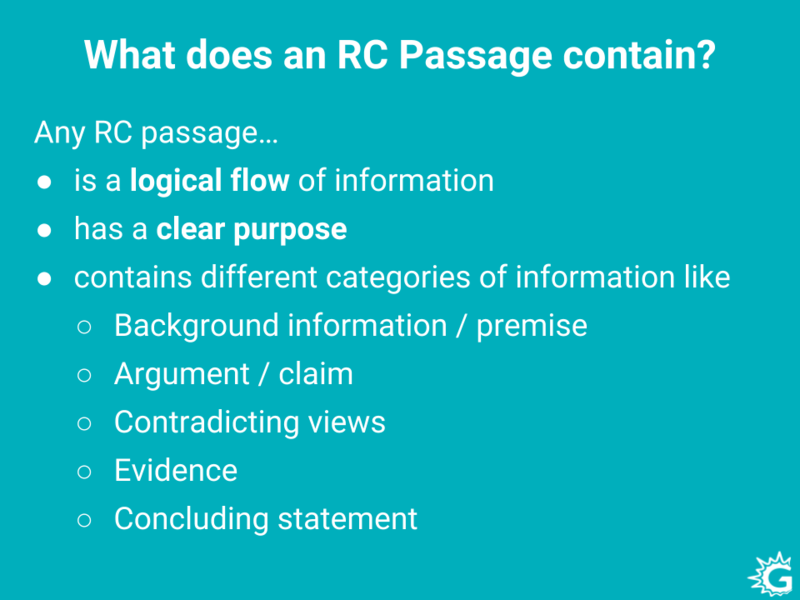 Now apart from the logical flow and a very clear purpose about what it wants to tell you, an RC passage also contains all of these categories of information. When I say ‘categories’, I mean this is more like this isn’t the info itself but rather the type of information that it’s going to try to convey to you. We have background information or a premise, right? Something that gives you a basic idea of the topic at hand would be the background information – it just primes you. Okay, you probably don’t know anything about marine biology I’m going to give you a couple of sentences to get you acquainted with that – that’s what your background information is. Apart from that, you may have an argument or a claim. An argument would usually try to support one particular side of something, a claim would try to put forth an idea and kind of push that and say “hear, hear all the supporting points”. Apart from that, you also have contradicting views. Sometimes arguments also present views a, b and c all of which contend with one another. How do they support which side of the argument? All of those are also seen in passages. You’ll also have evidence – so if there’s a claim given, there may be evidence supporting that claim to make it a much stronger claim. Then you also have concluding statements. Now note that not all passages have concluding statements – that may be presented in other ways. It may not necessarily look like a conclusion, but it would come to some sense of a conclusion. So passages contain these kinds of information. We’re going to get a better idea of those in just a second. So these are the elements of a GRE Reading Comprehension passage that you need to keep an eye peeled for, alright? So as I mentioned earlier, there’s background information – it is something that is meant to familiarize you with the topic at hand. They’re not just going to go deep into marine biology without giving you any sense of an introduction. You will have some background information. A claim is something that is like the central idea being discussed in the GRE RC passage. 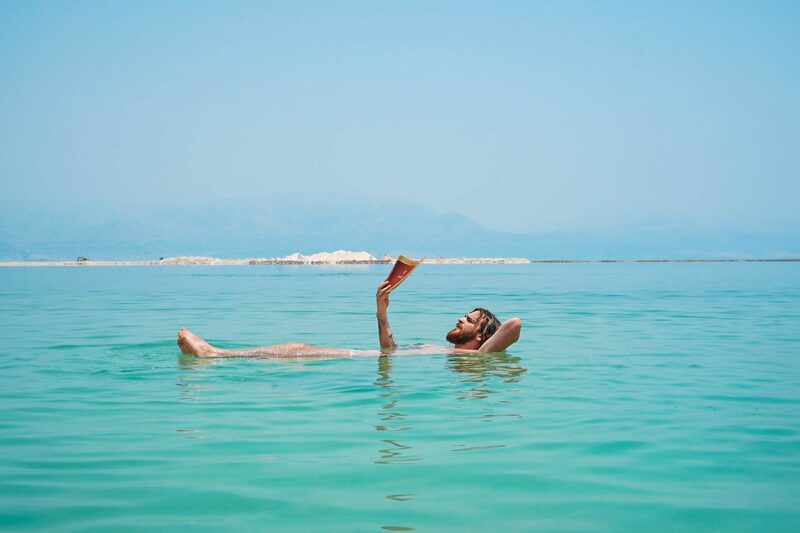 The passage isn’t going to talk about marine biology as a whole or introduce the study to you in a very generic way – it’s going to have a very specific claim being made about something particular within marine biology. That claim is going to be what’s discussed in the passage. Sometimes you have what’s called a problem statement– it is an idea that is being contended inside the passage. You would have a question being raised – ‘okay, why does this happen’? ‘What is up with this phenomena?’. That may be what people argue about and those arguments are what are presented in the passage. You also have additional views contending views on that idea or a person. It could be about a person so the passage may begin by mentioning a person of a particular time period and say these were their achievements, these were what they did that people felt a, b and c things about them and these are the different views that we get. In addition you also have something called the cause. A cause is anything that’s a reason behind any phenomenon or an event so if we’re talking about gamma rays, a cause may be the thing that causes this. That is the reason behind that particular phenomena. They also have an effect of cause, something that is the result or the output of an event so of course don’t assume that just because there’s a cause in a passage you may have an effect. These may appear in different ways. We’ll look at some reading comprehension examples to show you what I mean. And of course there’s something called a mechanism. You don’t have to worry about the terminology but this just refers to a description of a phenomenon or an event. So not only do you get a cause like ‘x happened because of this’ or in effect ‘due to x something happened’, you may also have the mechanism of x. You may get an idea of how x takes place, how it happens and all of the stages or steps involved – that would be the mechanism. Finally and this is something that is very important, that makes a lot of GRE RC questions very tricky- it’s the author’s view and this term refers to the author’s opinion on something in the passage. Please note in the case of GRE RC passages, the authors view is never something that’s very emphatic, it’s never very strong. So they’re never going to one hundred percent support or deny something, reject something – it’s usually something relatively nuanced. It may support but they may not be extremely happy or at the same time they might not feel completely dejected. So you’re looking at a very nuanced opinion in these highly academic texts and that is what the authors view comprises of. We’ll see some examples to get a better idea of how these function in our RC passage. 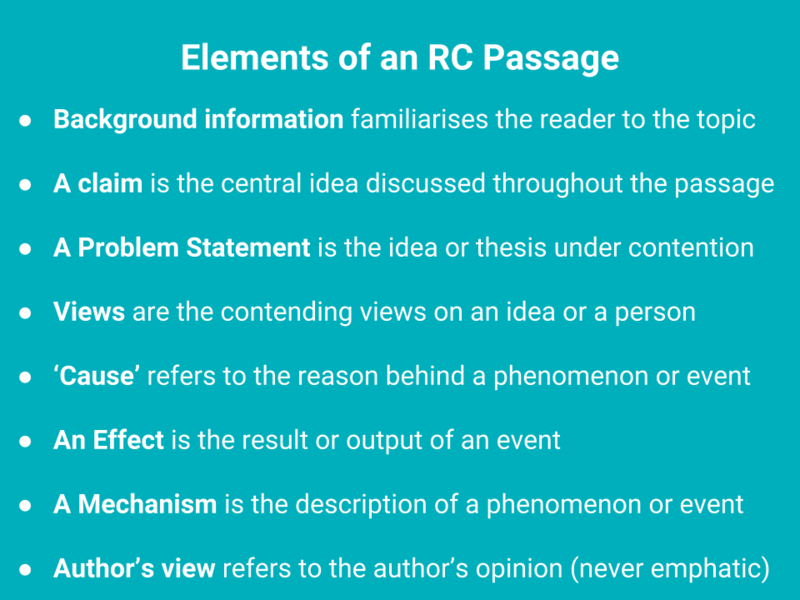 Now that we know the elements of a GRE Reading Comprehension passage, I’m going to tell you about the two broad categories of RC passages and we’re going to look at one RC passage of each type to see how those elements function in those categories – how those elements make meaning in those passages. The first category is exposition– this type of passage provide a comprehensive description of any idea or theory. So the whole point of the passage is to describe something. It is not trying to advance an argument but rather just explain something or how it happened. The other type, you may have guessed this – argumentation. That is something that presents two or more sides of an argument or a contention. It may or may not have a resolution. Just because there’s an argument, don’t expect there to be an answer at the end saying “hey side a wins over side b”. It may just be an argument that cogently presents these two different sides, maybe gives the author’s opinion at the end and leaves the rest for the reader to think about. 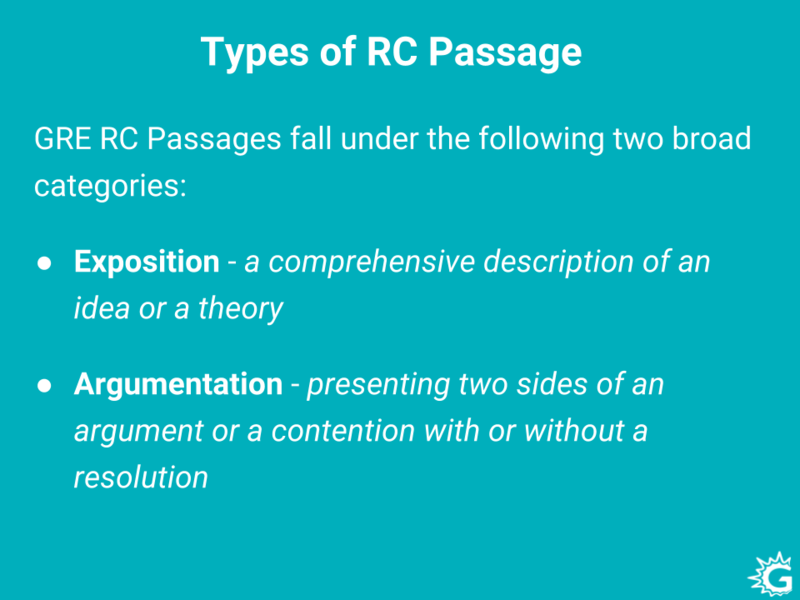 So these are the two broad categories of RC passages you’re going to look at. We have expositions- something that describes an idea or theory and argumentation- something that argues, that presents the two sides of an argument and you may or may not have a resolution over there. Okay now we’re gonna look at one of each type and try to identify those elements that we looked at earlier in those and see how it makes it a lot easier for us to understand the passage as a whole. You can see by reading the passage how you can identify whether it’s expository or argumentative in nature. It’s going to be relatively obvious once you get the hang of it. Now let’s go ahead and look at what exposition type passages always contain. Now the order may differ in an exposition passage – like in one passage you may see these in this order, another you may see another order, but all of these passages will contain these elements. They will have background information because after all they are describing a phenomenon or an event. They will also have some kind of a claim or idea being discussed in the passage. They will have any of these- a cause, an effect or a mechanism describing the phenomena and its effect. Remember again it’s an exposition, it is introducing something- it is explaining and describing something. All of these elements could be seen. You don’t need to have a cause and an effect in the passage. You may just have one or two. You may even have all three and finally you will also have the author’s view in this type of passage. At the end of everything, the author may present what they think about this particular phenomenon. 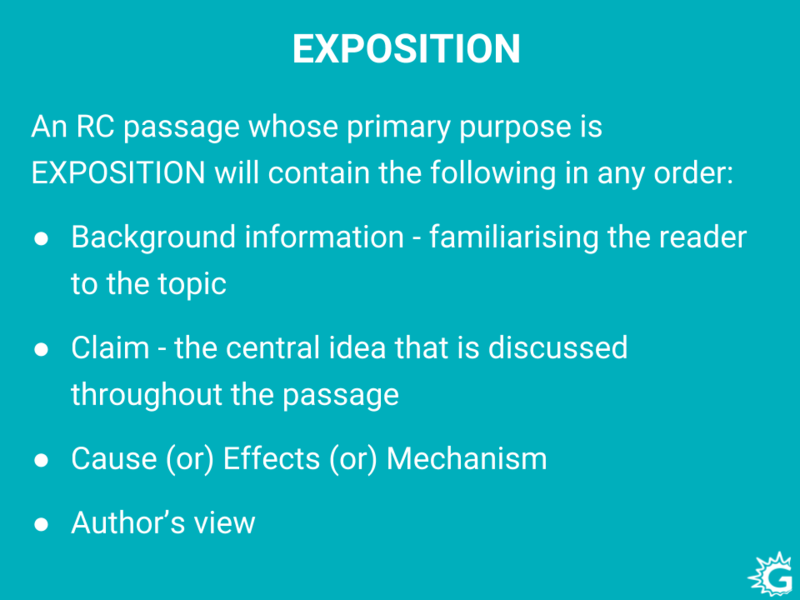 So that is what a GRE RC exposition passage will contain. Let’s go ahead and take a look at an RC passage example to get a better idea. This is a relatively short reading comprehension passage. Let’s go ahead, read it and see how we can identify the elements of this exposition passage. Reviving the practice of using elements of popular music in classical composition, an approach that had been in hibernation in the United States during the 1960s, composer Philip Glass (born 1937) embraced the ethos of popular music in his compositions. Glass based two symphonies on music by rock musicians David Bowie and Brian Eno, but the symphonies’ sound is distinctively his. Popular elements do not appear out of place in Glass’s classical music, which from its early days has shared certain harmonies and rhythms with rock music. Yet this use of popular elements has not made Glass a composer of popular music. His music is not a version of popular music packaged to attract classical listeners; it is high art for listeners steeped in rock rather than the classics. Okay I know that that may seem like a lot to take in but let’s go ahead and break it up. I’m going to just break it up into smaller chunks with some portions highlighted. Let’s take it one sentence at a time alright – so we have the introductory sentence over here where the first chunk tells us that somebody revived a certain practice. It’s the practice of using elements of popular music in classical composition. So we already know his past or know that this is going to be something to do with music. We have two distinctions. We have classical music and we have popular music. According to this first chunk, we see that some popular elements are being used in a classical composition. So classical composition is expected not to really have elements of popular music but over here somebody is reviving the practice of doing that. Of course there’s always the nuance- note the word ‘revive’ means this practice has always been around but whoever’s doing it is reviving it which means it was not so much in popularity for a while. That is what the second chunk tells us. ‘An approach that has been in hibernation in the United States during the 1960s’. What approach does that refer to? Using elements of popular music and classical composition. It had been in hibernation in the United States during the nineteen sixties. ‘Hibernation’ as you may know refers to a long period. I’s a phenomenon that’s observed in animals. They go to sleep for a long time and during that time they’re not at all functional, their body functions go down to the very minimal, nothing is active. That’s what hibernation refers to. So this use of popular music elements of popular music in classical composition was in hibernation for some time until composer Philip Glass came along and revives this practice. He embraced the ethos of popular music in his compositions – so we have a composer Glass reviving this particular approach and he likes using elements of popular music in his compositions. So what type of composer do you think Glass is? Now when I ask you a question like this you may wonder “why don’t we just move on to the next sentence”? But no, I’m going to tell you it’s very important for you to pause and really think about what you just read okay? So what do we know about Philip Glass as a composer ? 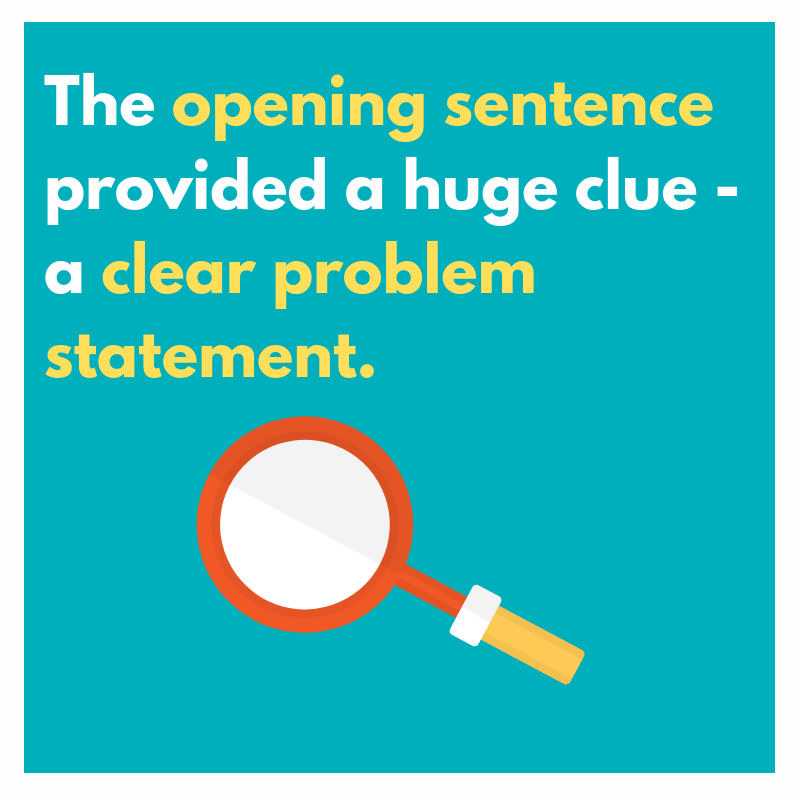 What is the context of the sentence? It’s talking about using elements of popular music in classical composition. That means Glass is one of those classical composers trying to employ these elements. Glass we know so far is probably a classical composer. Now we have this opening sentence – it’s telling us that Glass did this. Let’s see what it’s followed up with. 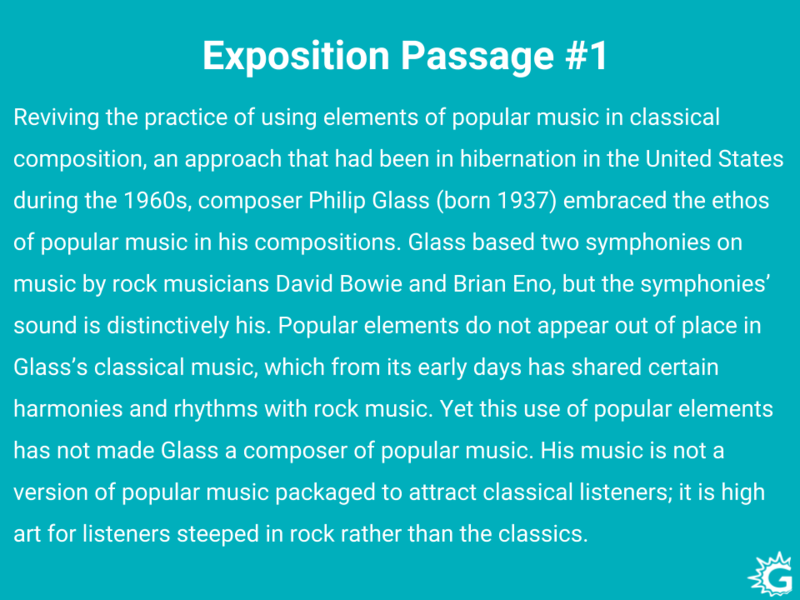 We have a sentence about Glass basing two of his symphonies on music of two musicians – David Bowie and Brian Eno and we also get a note saying that the symphony sound is distinctively his, right ? So even though he based those symphonies on music by other people the sound was something that was his own. It’s not like he just imitated what they did. When you heard it it, you would think “yeah, that’s Philip Glass”. You wouldn’t think of Bowie or Eno, you would think it’s Glass right? It’s distinctively his, he really owned it. But what is the context of the sentence in the passage ? Get a GRE Study Plan tailored to your needs and goals! Well, we just read that he liked to bring an element of popular music in classical composition. We know that he’s a classical composer but look at that, he’s based two of the symphonies on music by rock musicians. One inference we could probably make is that rock music is something that is typically considered popular rather than classical. Here we have a concrete tying together of the word popular and rock music right? So because Glass has from his very early days had music very closely resembling rock music, kind of having these rhythms and harmonies similar to to rock music. Now, even though we know these popular elements are out of place, we don’t feel they don’t belong in Glass’s classical music because Glass has been doing this for a long time. We don’t think it’s something out of place, it’s something relatively natural, we’re really used to it. Again context of the sentence of the larger picture what is the connection with the previous sentence – we saw that Glass based the symphonies on music by rock musicians. Now we know he’s been doing that for a long time, it’s got a lot of harmonies and rhythms linked to rock music. Popular elements are therefore not surprising in Glass’s classical music. Finally the last chunk told us that yet this use of popular elements has not made Glass a composer of popular music. Hey, what does that mean ? It’s trying to establish that even though he used all of these popular elements he doesn’t suddenly become a composer of popular music as opposed to what? That’s right, we saw earlier that he is a classical composer so even though he’s used all these popular elements he doesn’t just suddenly become a composer of popular music, he is still a classical composer. Why? Let’s see what the author has said. ‘His music is not a version of popular music packaged to attract classical listeners, it is high art for listeners steeped in rock rather than the classics.’ Right, so we’ve seen that his music is not about trying to make popular music appealing to classical listeners, right? At the end of the day he’s still a classical composer, he is not a popular composer. But he’s also got these popular elements. Those who are steeped in rock can go to a higher art form through his music – that is what they gain from this, right? So now we’ve understood what the passage is talking about. They’re not different views being presented. 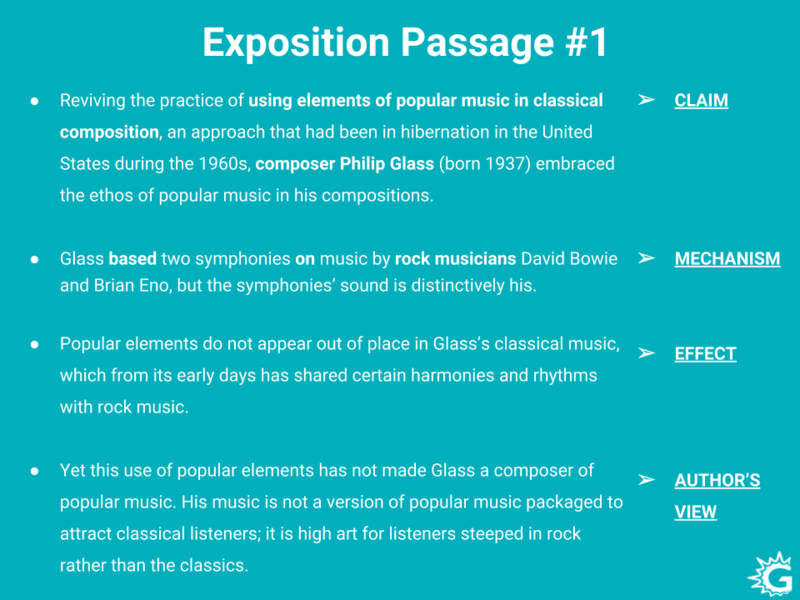 The whole passage is trying to push only one claim – the claim that Glass is somebody who embraced popular music in his classical compositions. So that is what that first chunk was all about, right ? It was pushing that claim – it was just telling us that that this is something I’d like to say about Glass, I’m going to describe this to you and this is a claim that I’m making about Glass. He’s somebody who would embrace the ethos of popular music. What does that follow up with? It follows up up with a mechanism, right? The next sentence was something that told us how Glass incorporated popular music in his classical compositions. There is a way that it is done. It’s the way an event or phenomenon takes place, it’s the mechanism of how Glass did this and that was then followed up by the effect. So because he would incorporate these things in his music, we know now that popular elements don’t feel out of place in his music, he’s been doing it a long time. The effect of that is that it’s not out of place, it doesn’t feel like it doesn’t belong whereas random classical composers trying to bring in all of these cool popular things may not do such a great job. Glass has been doing it for a long time and this is the effect. 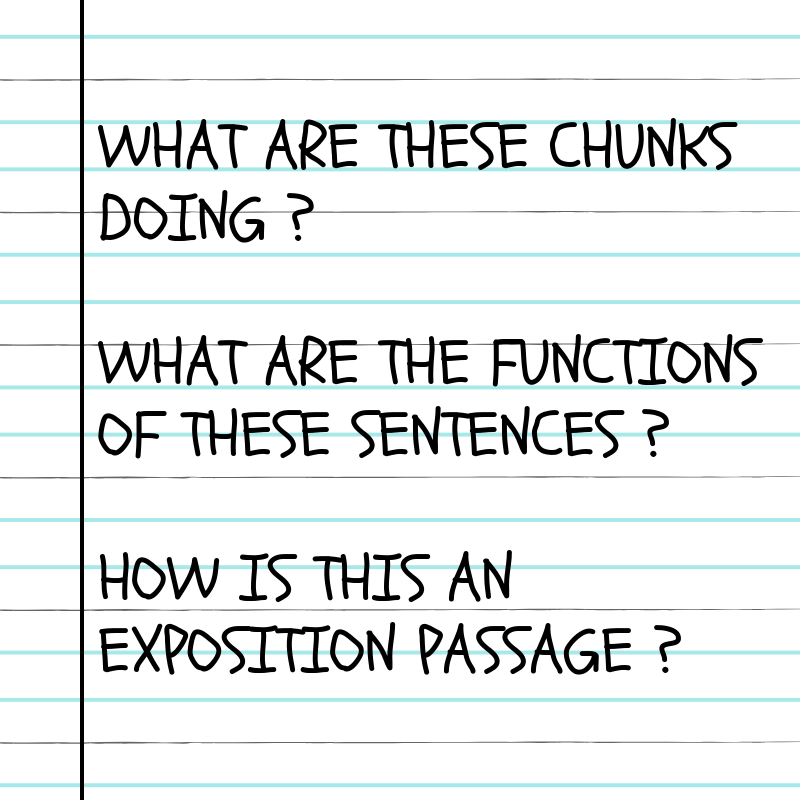 Looking for more RC Exposition type practice questions? Finally, if you paid close attention, you were getting the author’s view at the very end right? The author is trying to establish. So far he’s talked about how Glass did what he did and what the effect of that was. Finally, the author here is trying to establish that Glass doesn’t become a different type of composer. The author’s opinion is that Glass is still a classical composer and the author is advancing that this is high art for listeners of this kind, right? This is the author’s opinion. It’s not like a general statement, it’s not like ‘the sun rises in the east’. It is an opinion and that is how this exposition passage concludes. It tells us something about Glass, advances that claim, tells us how that works and what its effect was and finally what the author’s opinion on that claim was. 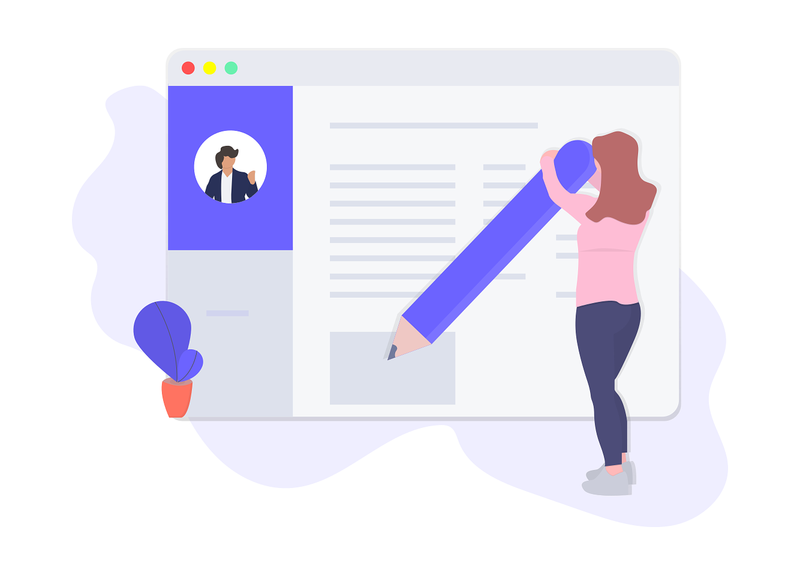 Now having understood all of the nuances of the passage, tackling the questions is going to be a lot easier for you because now you’re able to differentiate the author’s view from the claim. You’re able to understand how Glass did what he did and the effect of what he did. Basically you got every little nuance of this passage there is to be understood. No matter what question somebody asks you are going to be one hundred percent sure. That is the advantage of knowing the structure and the organization of a passage – the type of passage you’re reading. We saw exposition, what is an argumentative type of passage? 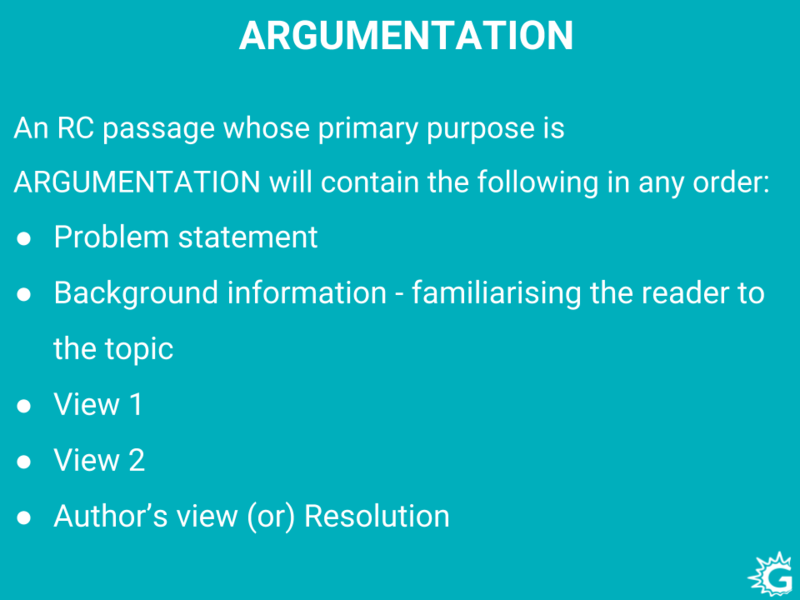 Well argumentative passages usually have the following elements – the primary purpose is to argue something so you can expect a problem statement, some issue being pulled up and some question. And once that great issue is pulled up, after that, you may get a little bit of background information on that issue – before we just dive into the debate, you may get some background information. After that you will be presented with a few views, okay? One view supporting one side, another view supporting another side. Those are going to be naturally presented in an argumentative passage. You can expect that. Finally you may also get the author’s view or a resolution to the problem. The authors view may pick either one of the sides. Let’s take a look at a passage to get a better idea here. It’s very obvious when you read the first sentence you know Felix Mendelssohn was a great composer. I’m sure all of you are like ‘yes, problem statement’ right? We have a question being raised – was Mendelssohn a great composer? What do you think this passage is going to be about? It’s probably going to be about answering this question, right ? Let’s keep reading on. At first the question seems absurd. ‘One of the most gifted prodigies in the history of music, he produced his first masterpiece at sixteen. ‘But Mendelssohn’s enduring popularity has often been at odds sometimes, quite sharply with his critical standing. Despite general acknowledgement of his genius, there’s been a noticeable reluctance to rank him with say Schumann and Brahms. As Haggin put it Mendelssohn as a composer was a ‘minor master working on a small scale of emotion and texture’- alright so I’m not sure if you felt that but the tone in this passage was way different from what we read in the previous one. Was Mendelssohn a great composer? We know this passage is going to try to answer this question. What came after that? 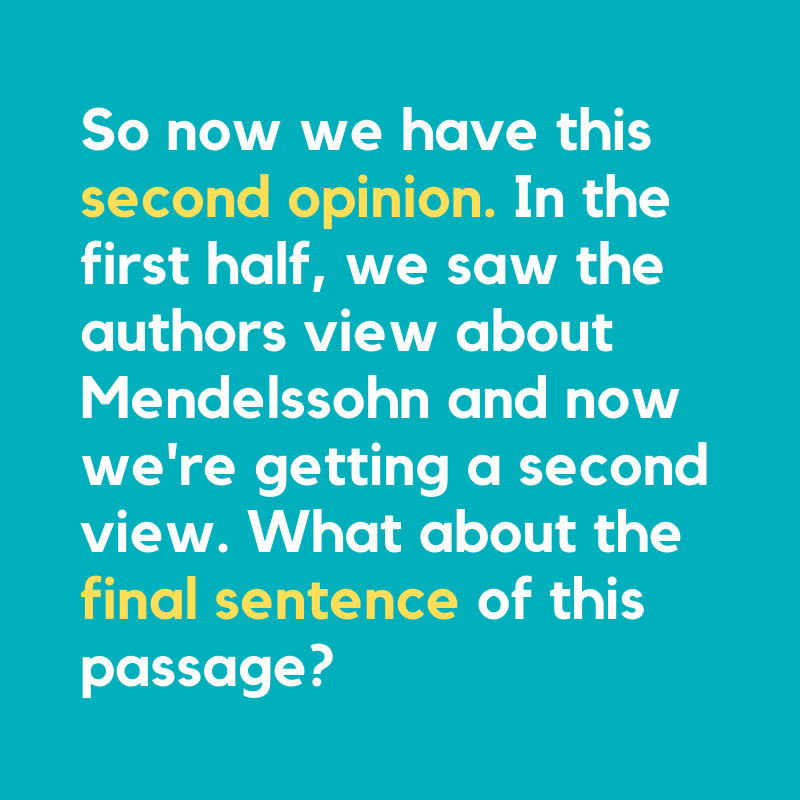 Well we saw the next couple of statements try to establish what we know about Mendelssohn. 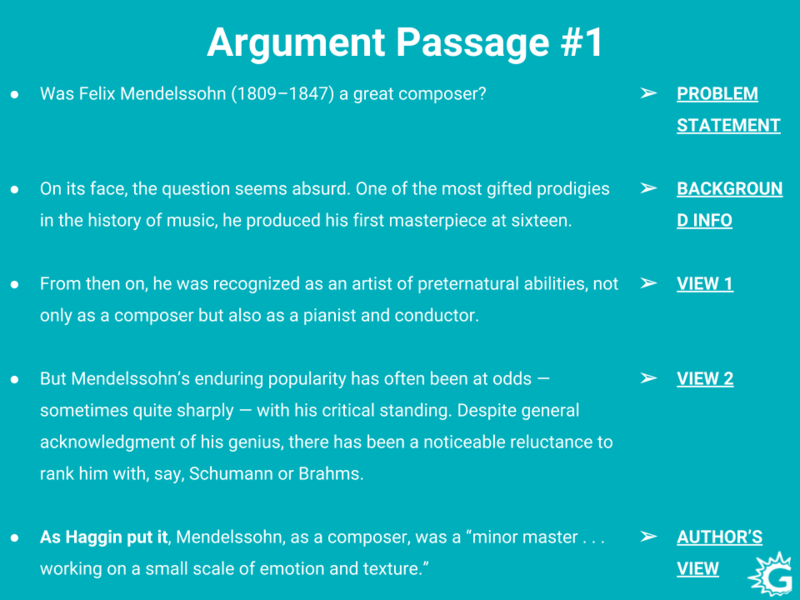 We think the question is absurd – we’re told something about Mendelssohn that he is one of the most gifted prodigies in the history of music that’s, that’s really building it up great! He produced his first masterpiece at the age of sixteen which is really young. So we’re getting a lot of background information – you can see that structure. What about the next sentence? ‘From then on he was recognized as an artist for his natural abilities not only as a composer but as a pianist and conductor.’ So after composing that first masterpiece, everybody saw that he was an amazing artist, he had all of these amazing abilities. He wasn’t just a great composer, he was also a great pianist and great conductor so that’s a lot of talent right? So more background information. We’re getting to know about his talents- what next? Okay so far, before we read the rest, what kind of answer are we getting? We’re getting one view. We’re getting a view that he was probably a really great composer right? Everything so far seems to support the answer that he was a great composer. ‘But Mendelssohn’s enduring popularity has often been at odds sometimes quite sharply with his critical standing.’ Right now, we see a contrast. We see the passage changing its direction. Now we understand that Mendelssohn, although he was really popular – ‘enduring popularity’ means he was popular for a really long time – this popularity has been at odds, right? It kind of hits heads with something else – what? His critical standing. What we mean by critical standing- his reputation amongst critics. So even though he was really popular which means lots of people loved him, that popularity did not agree with how critics felt about him. How critics thought of him and there was a ‘stark difference’ suggests it was quite sharp. There was a stark difference between these two. What else do we learn? Despite general acknowledgement of his genius there has been a noticeable reluctance to rank him with, say Schumann or Brahms. The passage says there is a general acknowledgement of his genius, everybody seemed to say ‘yeah he was a great composer, yeah he was quite the genius’. Despite this here was a reluctance to rank him with two other guys. Okay, we have a Schumann and Brahms. It is perfectly alright if you don’t know any of these names, if you don’t know who Mendelssohn is or who Schumann is, who Brahms is, don’t feel frightened, you can still understand the gist of the passage. You never even have to know who Mendelssohn is. Shyam's score increased by 26 points. See what he has to say! Just from the first two seconds, we’ve learned a lot. That is what I meant. The background information they will provide you is enough to understand the context. From the sentence here that we just read, ‘a noticeable reluctance to rank him with Schumann and Brahms, what do you think about Schumann and Brahms? Are they better composers than Mendelssohn? How did critics feel about them? Actually you can understand from the sentence, just from the sentence structure alone you can learn a lot. There’s this contrast word ‘despite’. So despite acknowledging his genius they didn’t rank him with Schumann and Brahms – so his genius was not enough for him to be ranked with Schumann and Brahms which means that Schumann and Brahms were ranked at a much higher place by the critics. So despite his popularity, his critics were not so happy with him – they didn’t like to rank him with Schumann and Brahms. As Haggin put it, “Mendelssohn as a composer was a minor master working on a small scale of emotion and texture”. Don’t get afraid if you see quotations like this, it’s very common across a lot of these GRE Reading Comprehension passages. They usually use these kinds of quotations to support some opinion or the other. It is your duty as a reader to identify which opinion is being supported. So over here Haggin has said something about Mendelssohn. Is this a positive thing or a negative thing? Well from words like ‘minor’ and ‘small scale’ we could understand that Haggin didn’t really have a good opinion of Mendelssohn. It’s not that he wasn’t such a great guy – he was working on a small scale, he was a minor master. He was a master but a minor one, nothing exceptional. So as Haggin put it, Mendelssohn was something not so great. Now what do you think? ‘As Haggin put it’ means the key here is that we actually have the author’s opinion being snuck in right there. It’s not just saying Haggin said it, it says ‘as Haggin put it’. So when you say ‘as my friend mentioned earlier’, you’re agreeing with what the friend says. Time = Money. In the GRE world, Time Saved = ???? The same way when the passage says, ‘as Haggin put it’, they’re actually agreeing with what Haggin said. That is where we’re getting the authors opinion. You can see that that was a concluding statement. Over here it didn’t really end the debate in a clear sense, it provided what the author felt was their opinion on Mendelssohn and they tried to support their opinion with Haggin’s critical input. 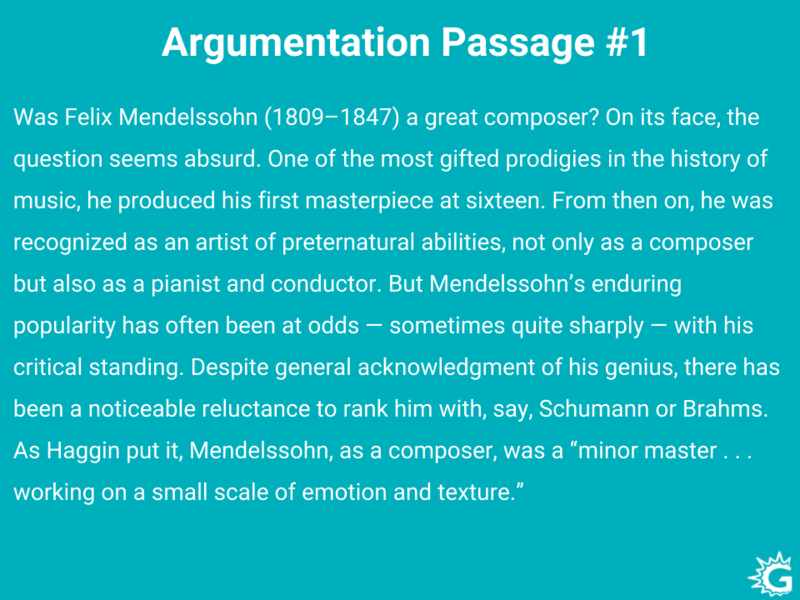 So we can see the structure of this was of the following type – we saw a problem statement, we saw some background info, we got one view on Mendelssohn, we got another view on Mendelssohn, finally we got the author’s opinion which is supported by this quote of Haggin’s. That is the structure of the passage that we just saw. We could see how the argument was advanced, how it was supported by different views and what note it concluded on. Now when you put all of the nuances of this passage in your mind, you’re very certain about what the author felt as opposed to what the general opinion was. So, I hope this gives you a clear idea on what these two types of GRE Reading Comprehension passages are and how it could help you arrive at what the passage is trying to say, what it really wants to convey and how it’s done. Now before I close for today – here are proven GRE Reading Comprehension strategies for long passages. 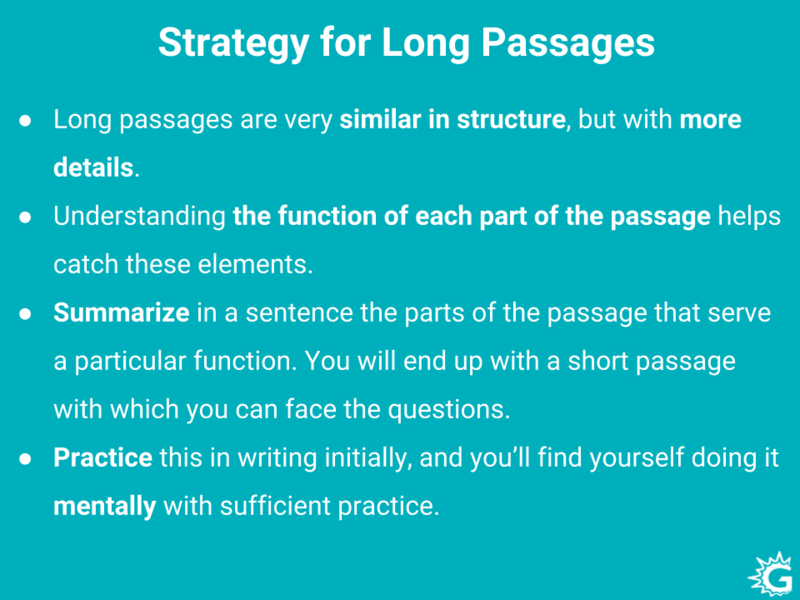 Both of the RC passages we looked at today were relatively short ones but nothing for you to fear- long GRE passages are very similar in structure to the short ones. They have all of the same elements, typically they just have more details. So if you get a view, it may get a little bit more explanation on that view or something supporting that view. It just builds out a little bit more but it’s actually essentially the same structure. The skeleton is the same. Just go back to these two structures, try to apply them, see what you’re reading and see if you can understand better what the passage is trying to say. I know that being said it’s very important to understand the function of a part of a passage. That is what helps you catch these elements. Think about what it is doing there, what is it trying to establish, is it supporting the view you just read about? Is it providing the author’s opinion? Is it giving you background information? Asking yourself those questions will give you a much much better idea of what you’re reading and what you’ve done. That is what you should do is every time you get a GRE Reading Comprehension passage. Doing that will give you a little passage with which you can face the questions. It’ll tell you exactly where to look when you need something later. That is a really helpful key because then you don’t have to sit through the entire GRE Reading Comprehension passage all over again. One good reading of the passage is more than enough to tackle those questions. If you do it right, you don’t have to be reading it again and again and again. The most important thing I hope you carry away from this is that these passages as you can see have clear logical structures, they either describe something or they argue something which means there’s always a story in there. 2000+ Practice Questions. 30+ hours of Video Lessons. 5 GRE like Tests. Personalized Feedback & more! There’s always something interesting for you to read about something new, for you to learn so please approach these passages with a very open mind. You’re going to pick up something very interesting. If you didn’t already know about Philip Glass before- he’s actually a very famous composer of film music so if you’re a movie buff especially those movies in the 1950s or so, you should really go back and see Philip Glass is behind a lot of that. So approach these GRE RC passages with an open mind and you will find that you learn a lot. Now I know that may seem tedious or difficulties to do these summaries and so on or to keep asking yourself all these questions but I promise you those are the steps you need to take to become a better reader and as I said, all of these passages are going to be the kind of content you’re going to see as graduate students in your dream university a few years from now so I cannot stress enough the importance of being able to handle this content. Initially write it out and eventually once you’ve had enough GRE RC practice you’ll start doing it in your head. You won’t need any cues, you won’t need to write everything down, it’ll comes naturally to you at that point. You’ll have become a very good reader- that’s something that’s going to help you for your entire life not just for one exam. Take a look at the following comprehension passages with questions and answer them with the knowledge from this blog. a.critical reading is a slow, dull, but essential process. b.the best critical reading happens at critical times in a person’s life. c.readers should get in the habit of questioning the truth of what they read. d. critical reading requires thoughtful and careful attention. e.critical reading should take place at the same time each day. There are no effective boundaries when it comes to pollutants. Studies have shown that toxic insecticides that have been banned in many countries are riding the wind from countries where they remain legal. Compounds such as DDT and toxaphene have been found in remote places like the Yukon and other Arctic regions. a. toxic insecticides such as DDT have not been banned throughout the world. b.more pollutants find their way into polar climates than they do into warmer areas. c.studies have proven that many countries have ignored their own anti-pollution laws. d.DDT and toxaphene are the two most toxic insecticides in the world. e.even a worldwide ban on toxic insecticides would not stop the spread of DDT pollution. 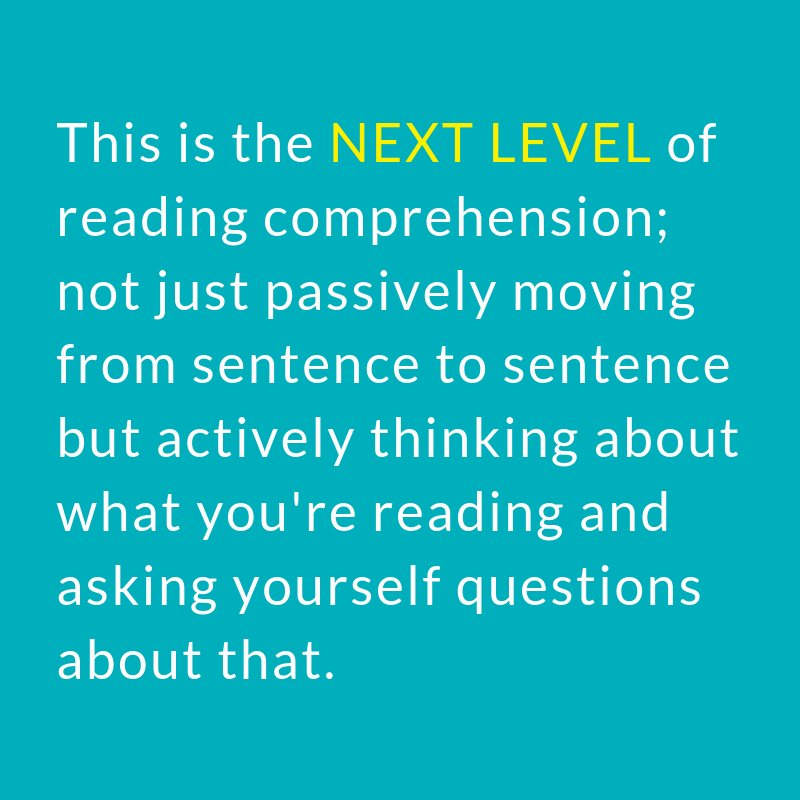 How To Tackle Reading Comprehension Questions! Which technique from today’s guide to the GRE Reading Comprehension are you going to try first? Are you going to work on your GRE RC passages right away? Or maybe you’re ready to start taking a few verbal tests.